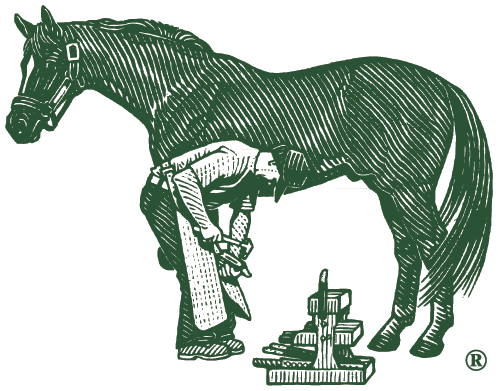 Hoof trimming or shoeing should be performed as recommended by your farrier, dependent upon level of work, condition of the hooves, and how fast the horse grows horn. As a general rule, no horse should go untrimed beyond eight weeks. With excessive untrimmed growth, hoof balance alters dramatically, at best decreasing the stride, comfort and performance of the horse, at worst causing permanent structural damage and lameness. Stabled horses should be kept in clean, dry bedding, with soiled bedding removed a minimum of once per 12 hours of stall keep. Ammonia from equine waste and decaying bedding is extremely destructive to hooves. A cycle that's especially tough on hooves, and difficult to control if it's Mother Nature changing your horse's pasture from mud to desert to mud again. However, if you're riding in a sand ring, then bathing, then immediately putting your horse in a shaving-bedded stall, you're perpetuating the cracking, chipping and peeling that can accompany rapid moisture changes in the hoof. And if you're bathing with soap, you're stripping the hoof's natural water-proofing oils and waxes. What to do? Keep moisture changes to a minimum, and consider using a topical application that seals in the correct amount of moisture, yet allows oxygen to pass through. In general, you should make cleaning your horse's hooves a daily event, especially before riding. This can prevent nasty stone bruises and thrush, a bacterial infection that eats away at the horse's frog and sole. Take care to clean the grooves on either side of the frog well, as that's where stones and bacteria tend to collect. The exception to daily cleaning is if your horse is pastured and barefoot, or tends to pack in only "clean" dirt. There are some good arguments out there that a "clean" dirt or clay pack actually supports the frog and does the foot good. Just remember, if you're not cleaning your horse's feet daily, you may not notice when a problem develops until he's lame. Should you detect a rotting smell when you clean your horse's feet, he probably has thrush. All horses are exposed to thrush; it's a bacterium that's always present. Thrush bacteria are opportunistic, multiplying in the absence of oxygen and the presence of waste. Don't use copper sulfate, tincture of iodine, iodine crystals or a bleach solution, all are highly damaging common thrush remedies that act as sealants, fostering anaerobic growth of bacteria. Instead, organic iodine such as providine combined with a softening and penetrating agent can be used in proper dilutions and applied to a clean, dry hoof. Of course, chronic or severe cases should always be attended to by your veterinarian or farrier. Remember that, as tough as hoof horn may seem, it's approximately 95% protein, much the same as your own hair and skin, and therefore as susceptible to damage. A great rule of thumb is to avoid any commercial or home remedy containing solvents, protein-altering ingredients, or anything that seals oxygen away from the hoof. You should also avoid remedies containing axle grease, motor oil, pine tar, formaldehyde, acetone, and turpentine.